In one sense . . . the way to Rainy Mountain is preeminently the history of an idea, man’s idea of himself, and it has old and essential being in language. The verbal tradition by which it has been preserved has suffered a deterioration in time. What remains is fragmentary: mythology, legend, lore, and hearsay – and of course the idea itself, as crucial and complete as it ever was. That is the miracle. Illustrated with drawings by his father, Al Momaday, The Way to Rainy Mountain is a beautifully crafted, deeply thoughtful book, an extended meditation on the past, memory, place, and existence. Comprised of 24 vignettes, the book features fragments and snapshots of Kiowa history, family history, personal history, and more. The first time you encounter The Way to Rainy Mountain, it is definitely like trying to solve a puzzle. What are these sections? What do they signify? Why is each section made up of three short text pieces – vignettes – presented across two facing pages? Does the order mean something? Does the three-part structure of each section signify something? I have my own theories about how to read the book – its weaving together of anthropology and scholarly history, of tribal memory and a grandmother’s storytelling, of a father’s guidance and a son’s gazing into the distance. But I think I should keep my theories to myself and let you – if you haven’t already read this magnificent book – figure it out for yourself. I had the great and wonderful pleasure of hearing and seeing N. Scott Momaday read at Hood College in Frederick, Maryland. I was teaching a course on American Ethnic Literature at the time, and as good luck would have it, there was a last-minute news story that Momaday’s reading would be open to the public the very week we were scheduled to discuss The Way to Rainy Mountain. I drove my class in a van over South Mountain Road the 40 minutes from Shepherd University to Hood College. We got there very early so as to get good seats – and we were rewarded with a front-row vantage point. You can hear Momaday’s magnetic, magical, booming voice in this video of a reading he gave at the University of California or listen to him tell stories at the Academy of Achievement – but these recordings are but pale representations of the charisma and light he brings to a room. He talked a great deal at Hood about The Way to Rainy Mountain and the companion book, The Man Made of Words . Both works had a tremendous influence on my writing of Power in the Blood: A Family Narrative , and it was a “lifetime moment” indeed to hear him speak, to talk with him one on one after the reading, and to have him sign my copy of The Way to Rainy Mountain. The journey herein recalled continues to be made anew each time the miracle comes to mind, for that is peculiarly the right and responsibility of the imagination. It is a whole journey, intricate with motion and meaning; and it is made with the whole memory, that experience of the mind which is legendary as well as historical, personal as well as cultural. . . . The imaginative experience and the historical express equally the traditions of man’s reality. If you want to sample The Way to Rainy Mountain, you can read the powerful “Prologue” to the book. But you really must experience the book itself, and there is no substitute for that than to purchase the paperback edition from the University of New Mexico Press. And if you’re as taken with Momaday as I am, you might want to read his Pulitzer Prize-winning novel, House Made of Dawn , which ushered in the Native American Renaissance in written literature; The Names: A Memoir ; and The Man Made of Words , a collection of essays, stories, and autobiographical remembrances. Watch:There’s more to come from N. Scott Momaday! Watch the seven-minute video trailer about Return to Rainy Mountain, a documentary-in-the-making about Momaday’s journey with his daughter to revisit Kiowa sacred places, the places that figured so prominently in The Way to Rainy Mountain. 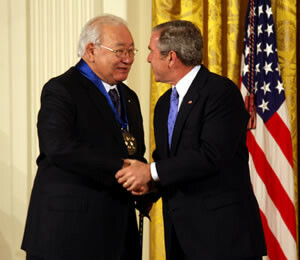 Image Credit: N. Scott Momaday receiving the National Medal of Arts from President George W. Bush in 2007; National Endowment for the Arts; public domain.